Seeing the Birds of Paradise requires getting up at 5.30 in the morning. This is not an hour that I usually see, nor have any desire to see, but if Colette can do the rope bridges I can do 5.30. It is the male Bird of Paradise that has all the finery. The female is quite plain. For once in my life I will refrain from comment. The male picks out a certain spot where he likes to display his feathers to attract the females. He returns to this spot at dawn and dusk each day and does his show. The guides know where these spots are, and we set off to see them. Having expected another jungle trek, I am delighted to find that we are to get into the bus. We set off up the road and pull in occasionally looking for the birds. Each time we stop, we have to get off the bus, which at 5.30 is a little too much exertion for me, but we don’t have to walk too far. Perfect. I am beginning to appreciate birding again. After several unsuccessful stops we finally see one. It is some way off but it is easy to spot because of its two long white tail feathers, which are several feet long. It is the ribbon tailed Bird of Paradise, which is one of the rarest, and we can see it clearly with our binoculars, but sadly it is too far away to photograph. We look for others, but without success. We spend an hour and half and see one Bird of Paradise. I know this is better than yesterday, but it still seems like a lot of work for very little reward. We return to the lodge for breakfast after which we will finally be visiting our first tribe. The previous evening one of the guides had given us a talk about the lifestyle of the local tribe so that we would have an understanding of what we were about to see. Within the Hulis there are almost a thousand different clans. Each clan is then divided into sub clans and then again into families. Each family (it is an extended family) owns their own plot of land which can be around 15 hectares. The land is marked out by beautifully built earth walls standing about eight foot tall, with sloping walls. They look as if they have been machine made, but they are all built by hand with nothing more than a shovel. The entrance to each family’s land is marked by a small gate, often with a bridge over a stream immediately before it. The bridge is usually nothing more than branches dropped across the stream. The Hulis are a male dominated society. The males have three possessions prized above all else. In order of importance, they are land, women and pigs. We suspect that occasionally the order of the last two can get mixed up. 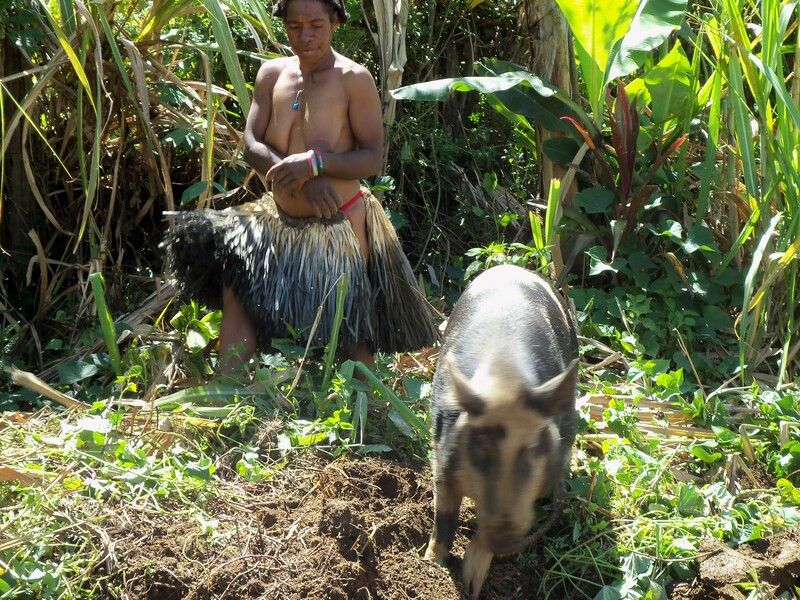 The pig is all important in Huli Society and is used to purchase a wife, pay a fine, or make retribution to another family that has been wronged. The men and women live in separate huts within the family compound. Husbands do not sleep with their wives. The men sleep in one hut, the women in another. The huts are made of bamboo and reeds. Despite the hot days, a fire is kept going at all times, but there is no chimney. 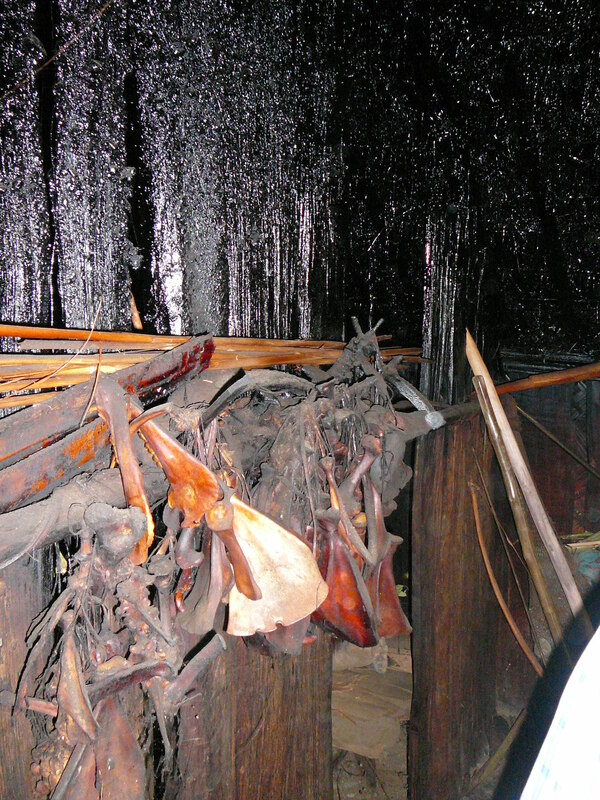 The fire sits in the middle of the hut and the smoke fills the hut and filters through the reed roof. The constant smoke coats the inside with a black tarred looking substance which makes the roof last for many years. Without the smoke the roof barely lasts a year. The fires are also useful when the nights get chilly. The men’s hut has one entrance, the size of a very small doorway. Their hut is much smaller and lower than the women’s. There are no windows It is small, dark and smokey with an earth floor. It feels extremely claustrophobic.I would much rather have a room at the Four Seasons. Actually I would rather have a room at a Motel Six, so you know how bad the hut must be. The women’s hut is a slight improvement in that it is taller and it has two doorways . The downside is that the second door is for the pigs, an entirely necessary arrangement as the women have to share their hut with the pigs. The men wouldn’t want the pigs sleeping out in the rain now, would they! The women do not cook for the men, each hut cooks its own meals. Sweet potatoes are the staple diet for the men, women and pigs. When the women cook their sweet potatoes, they cook enough for the pigs as well, and their meal is shared with the pigs in the hut. Are you beginning to understand why men view pigs and women on much the same level. The mens’ responsibilities include cutting down the trees, bamboo and palm leaves, building the huts, protecting their land, wives and pigs and going to war with the neighboring clans when necessary. The women are in charge of the children, the pigs, and the land. 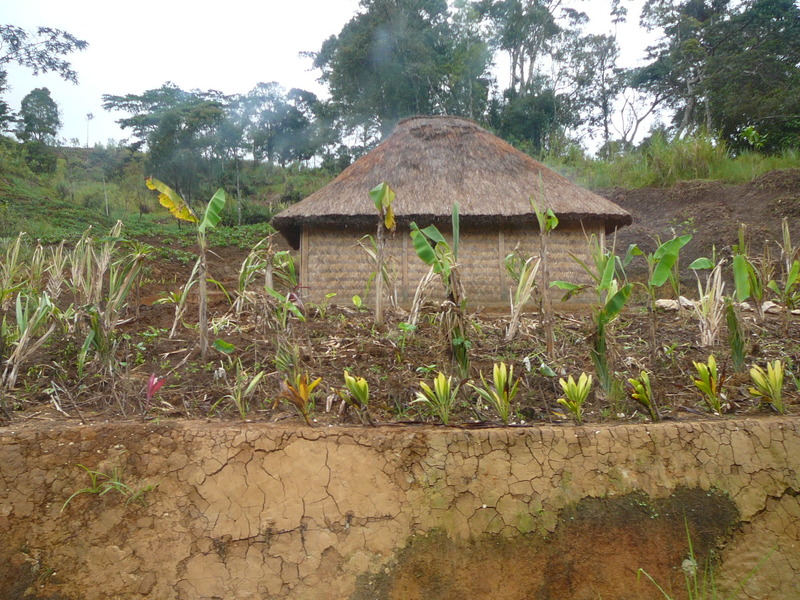 The land is incredibly fertile and is planted with all sorts of vegetables, but sweet potatoes are the main crop. The fertile land and the women’s gardening skills insure that no one ever goes hungry. We never see undernourished people. In fact they all look remarkably fit and healthy. The pigs also look remarkably well fed, and it is important for the women to keep them that way as pigs are basically money in the bank. The women take any excess fruits and vegetables that they can grow to the market to sell. A wife must be purchased by the man. The cost of a bride is thirty pigs for the bride, plus one for the bride’s mother. This is another occasion, when much to my amazement, and no doubt yours, I am not going to make a comment. But you might like to take a look at your friend’s wife and decide whether she was worth it. A man can have as many wives as he can afford. A woman can only have one husband. I leave it to you to decide who gets the better deal. A man can only afford a second wife by having another thirty pigs, so his main aim in life is to acquire more pigs, but his first wife, if she is smart, spends most of her life trying to stop this happening. Ironically it is the wife’s job to look after the pigs. Pigs are only slaughtered for special occasions. A smart wife tries to come up with a lot of special occasions. When a man is looking for a wife, beauty is not the most important thing to him. He wants a hard working wife who will tend the garden well, look after his children and rear his pigs. Women carry everything in a bilum bag which is like a large string bag with extra long handles. The handles go around the woman’s forehead and the bag hangs down her back. She carries everything in this bag including her babies. 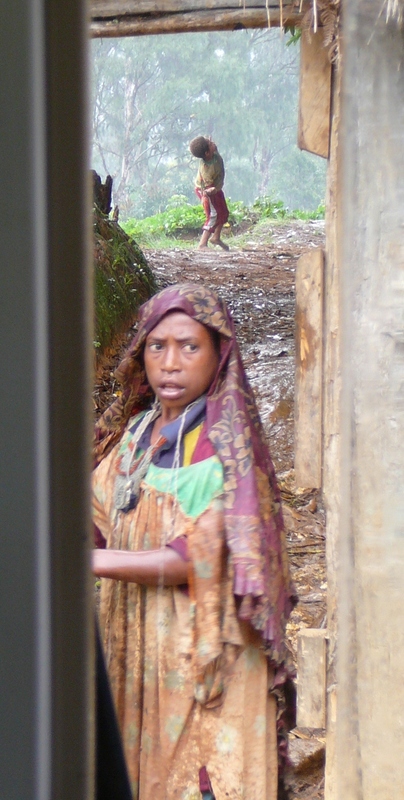 It is not uncommon to see a woman with two bilum bags hanging from her head. 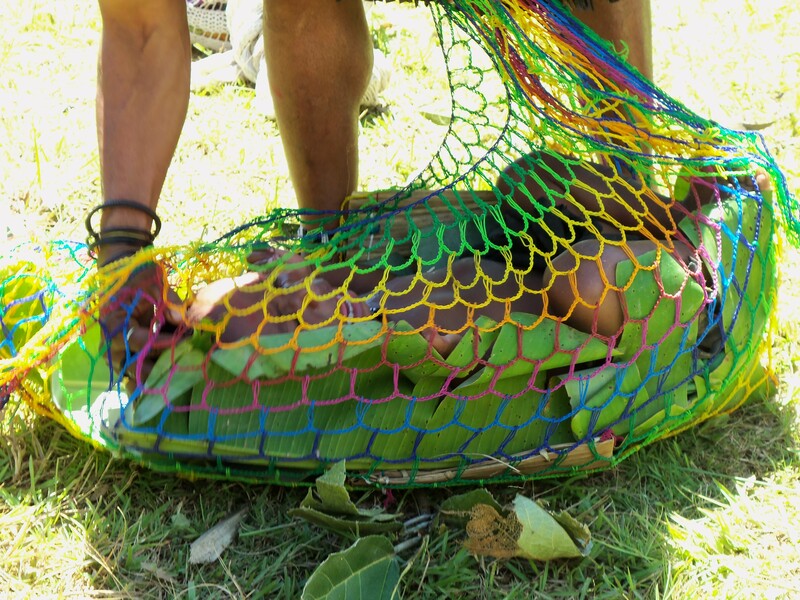 One with her baby and the other laden with vegetables. A hard working woman often loses a lot of hair from the friction of wearing heavy bilum bags. Consequently a man looking for a wife is attracted by bald women. 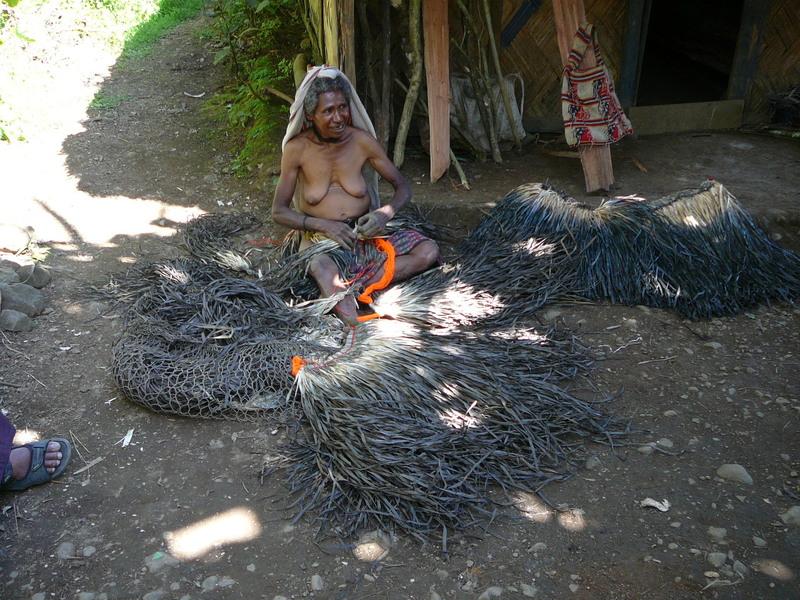 This entry was posted in Papua New Guinea and tagged birding, Huli, pigs, PNG, tribes. Bookmark the permalink. ‘I’m A Hog For You Baby’. For some reason I can’t get that song out of my mind. heh loves I’m only interested in the Crocodile Dundee stuff can you please email me when when that post appears ! !